In the bowl of a food processor, combine black beans, shredded cheese, tortilla chips, green onions, taco seasoning, cilantro and avocado. Pulse until well combined. Form mixture into 1-inch patties. Heat a large skillet over medium-high heat; coat bottom of skillet with canola or vegetable oil. Cook patties until deep brown and cooked through, about 3 minutes each side. Transfer to a paper towel-lined plate to drain and cool slightly. Meanwhile, make the lime cilantro yogurt sauce: Combine yogurt, cilantro, hot sauce, lime juice and salt in a small bowl. Spoon sauce on tortillas, top with falafel and garnish with sliced avocado and salsa, if desired. There are two things I love in this world: Mexican food and falafel. So imagine how much my mind was blown when I discovered that you can, indeed, have BOTH at the same time. It was epic, let me tell you. These Tex Mex Falafel Tacos were the source of said mind blowage. 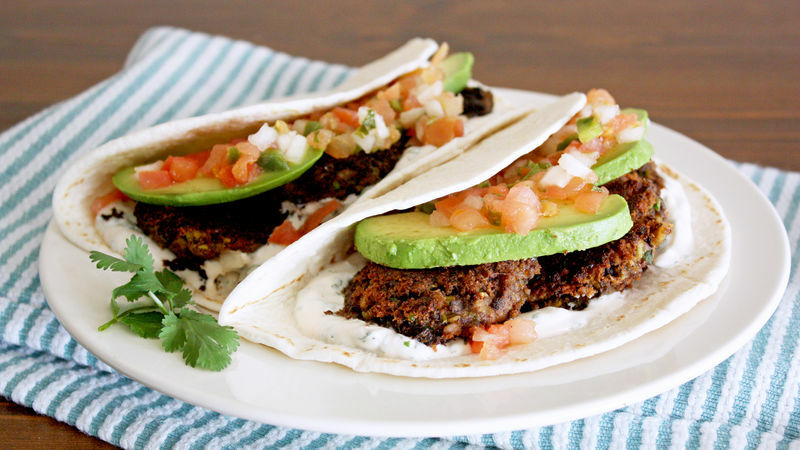 When you make crispy falafel patties using black beans, taco seasoning and other Mexican-inspired ingredients, then tuck them into a tortilla with creamy lime-cilantro yogurt sauce, sliced avocado and fresh salsa, well... just be prepared for them to blow your mind, too. To start, combine your falafel ingredients in a food processor. I used black beans in place of the usual chickpeas and added shredded Mexican blend cheese, cilantro, taco seasoning, crushed tortilla chips, chopped green onions and mashed avocado. There’s some serious flavah up in thurr. Once the mixture is well blended, form it into small patties, like so. Fry up the patties in a hot, well-oiled skillet until deep, dark brown on both sides (you want to bring them as close to charred as possible or the middles will still be mushy). Meanwhile, gather your other ingredients, like the yogurt sauce, salsa, avocado and tortillas. Assemble your falafel tacos (or falafelacos, as I like to call them) and weeeee!! Mind = BLOWN. And mouth = YUM. Falafel Pizza: Swap one or all of the meats on this meaty pizza with falafel patties and add Middle Eastern-inspired ingredients, like onions, tomatoes, olives and feta cheese. Spaghetti and Falafel “Meatballs”: Sub classic or vegetarian meatballs for falafel on top of the ol’ spaghetti for a tasty twist on the traditional duo. Falafel Meatball Subs: Serve sub sandwiches stuffed with falafel instead of Italian meatballs, hummus instead of marinara and feta instead of mozzarella for a flavorful mouthful. Falafel Burgers: Ditch the hamburger and bring in a meaty falafel burger patty to round out your next cookout. Psst – the tzatziki sauce is TO. DIE. FOR. Couscous Salad with Falafel: Save the honey mustard chicken in this recipe for another day and top the couscous with falafel balls for something different and delicious. Stephanie (aka Girl Versus Dough) is officially fullafalafel. Check out Stephanie’s Tablespoon member profile and keep checking back for her own personal recipes on Tablespoon!